Link: The station’s prime function is to transmit and to receive data passed through space via earth satellites represented by the decrescent and to communicate by radio waves. The roundel depicted black, represents the dark continuum of space through which the radio waves have to pass. The Petasus, the winged helmet of Mercury, symbolises the carriage of those messages past the earth’s boundary. 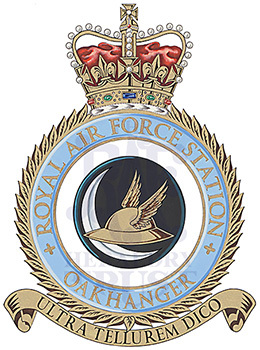 History: Transferred from Army Department on 20 December 1967 Closed as an RAF Station on 30 June 2003, although an RAF presence was maintained until 20 December 2003 when it passed to civilian control.